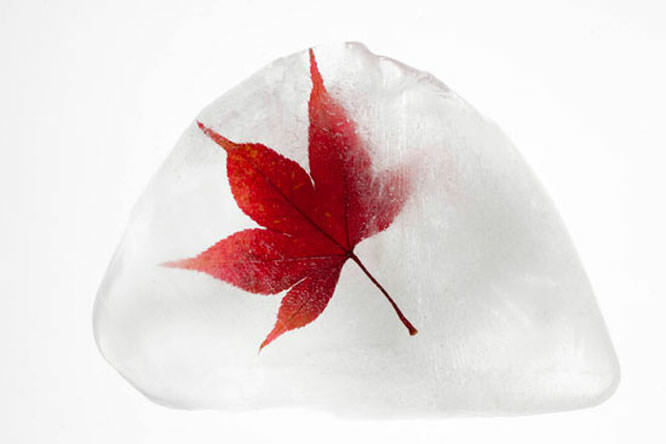 Give your leaf portraits a new twist by freezing them in ice. As the leaves turn colour and fall off the trees they present us with another photographic opportunity to shoot autumn themed images in a very different way. The technique we're talking about is freezing colourful leaves and photographing the ice block. By freezing whole leaves in a pan of water you'll not only have colourful photography, but interesting and unique ice patterns to photograph too. It's best to do this technique outside if you can as the light's better, they'll be less cleaning up and there isn't electrical equipment to fry as there is in a studio! Kit wise, you'll need a macro lens on the front of your camera so you can get in close to the cracks that spread over the colourful leaf textures in the ice. You can leave the tripod inside, but make sure you have a reflector handy as it will help direct light into the dark areas the sun can not reach. If you have something that can support your ice block so light can shine through it – great. If not, freeze it in a clear container and place it on a light coloured surface. Shallow containers work the best as you only need a few inches of water for this to work. You may also find coloured paper/card useful to add a punch of colour to the background of the image. Place your leaf, vibrant autumn colours work the best, face down in the container, add water and put it in the freezer. If you can, pick leaves with splayed tips so light can shine through them. After about 30-40 minutes check your container as the leaves may have floated to the surface and moved position. Once it's frozen take the container outside and start shooting. Small apertures, around f/22, will give you great depth-of-field so you'll be able to shoot patterns right through the ice. Check your camera's meter reading and if needs be spot meter from the leaf so the camera doesn't get confused from the light shining off the ice. Look for interesting designs, areas where air bubbles have gathered and unusual shapes that cut across the colourful leaf. As it will take a while for the ice to melt, head back inside, put the kettle on and come back out to the ice every half an hour or so to snap the frozen air bubbles and water as it melts.